Home � Miscellaneous Magic , Trip Planning � Transportation Trading Cards - Unadvertised Magic from Walt Disney World! Transportation Trading Cards - Unadvertised Magic from Walt Disney World! Are you someone that has taken your family to Walt Disney World a few times and are looking for something different to do on your next visit? Or perhaps you are looking for a souvenir that doesn’t break the bank. Well, I have four words for you: Disney Transportation Trading Cards. Disney World has created a set of 18 trading cards that are based upon the various modes of transportation at the Walt Disney World Resort. There are three bus related cards, three watercraft (Ferryboat, Motor Cruiser, & Motor Launch) related cards, and twelve monorail based cards. The best thing about them is that they are FREE! They are not for sale (eBay aside), they have to be collected, usually one at a time. Collecting an entire set is not easy, but what worthwhile challenges ever are? The cards are given out the by cast members operating the various forms of transportation. To obtain a card, you need to politely ask the driver/operator if they have any Transportation Trading Cards. They are given limited numbers to distribute, so they may not have any on hand at all times. The key is to be polite and remember to thank them if you do receive cards. The bus drivers will only have the bus related cards, and the monorail operators will only have monorail related cards, etc. So you will have the fun of exploring the various transportation modes if you wish to collect all 18. The cards themselves depict the mode of transportation on the front and have interesting facts about it on the reverse side. These are nice trading cards and make fine items to keep and collect. Don’t expect to be able to collect the entire set during one trip, unless you plan to spend a large portion of your vacation riding the Disney Transportation System(although some of you may really enjoy it.). I would recommend that if you want to collect all of them to expect that it will take more than one visit and try to pick up the missing cards during future vacations. This is yet another form of unadvertised Magic that can be found at Walt Disney World! 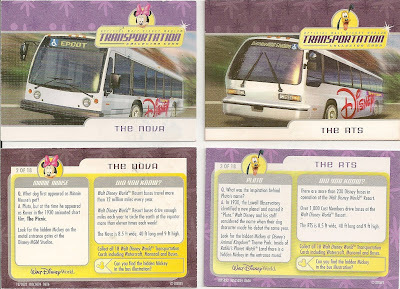 0 comments to "Transportation Trading Cards - Unadvertised Magic from Walt Disney World!"